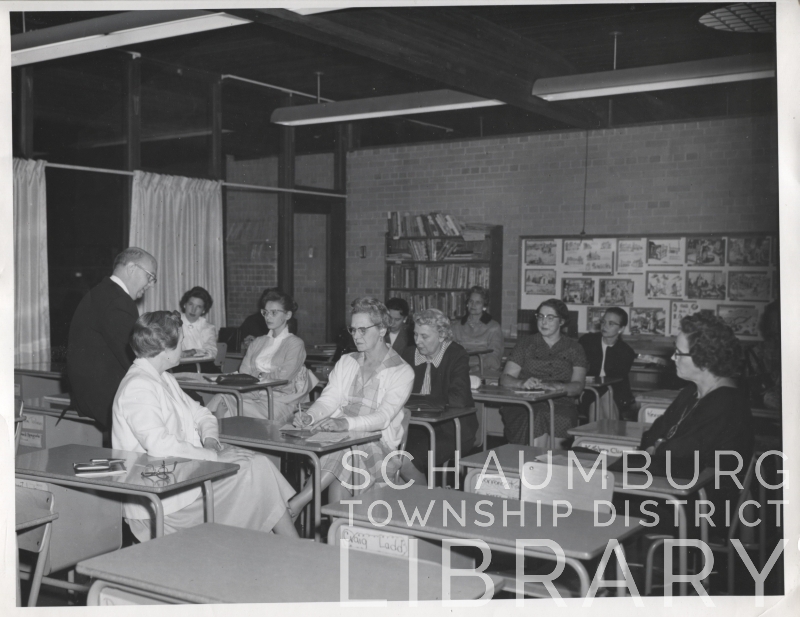 Until the start of the spring semester of 1954, the public school children of Schaumburg Township had been attending one-room schools. 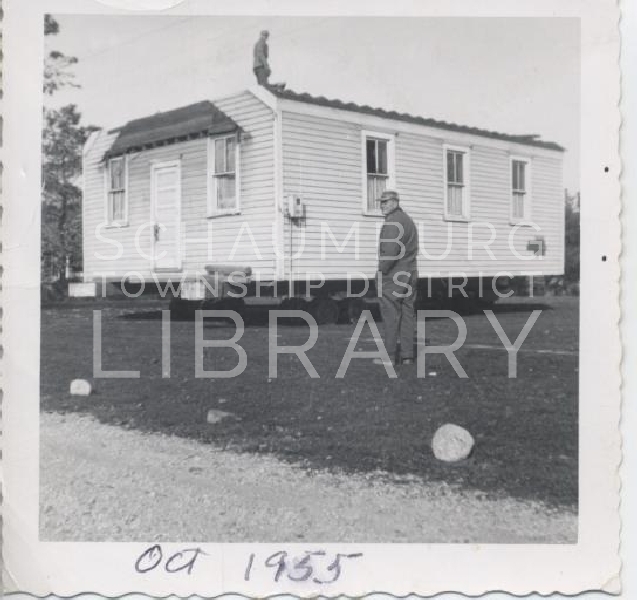 The two remaining schools of the five one-room buildings that had once been sprinkled throughout the township, were the District 54 School at Schaumburg and Roselle Road and the District 51 School on Higgins Road near Huntington Boulevard. They are shown below. In 1952, however, these school districts consolidated into School District 54. On December 20 of that year a special election gave the Board of Education approval to purchase and construct a school site for the district. The school board then chose a site on the north side of Schaumburg Road, just west of Plum Grove Road. A later article of April 30, 1953 stated that “Mr. Schweikher is still drawing up plans for the new building, to cost $150,000.” He must have been a busy man, scurrying to get these plans finalized, as this was near the time that he was departing the area and his architecture practice to take the role of Chair of the Yale University Architecture Department. Interestingly enough, his son Paul attended the one room school at Schaumburg and Roselle until their departure. The following photo, compliments of William Engler, is of the groundbreaking of the school which must have taken place in the spring or summer of 1953. Mr. Engler’s father was one of the trustees. From left to right are: John Bierman, Frank Wiley, Al Straub (behind William Greve), William Greve, Herbert Buesching in the dark framed glasses, Emil Lichthardt, Paul Engler, and Henry Hartman. The 1953-54 school year began with the students of District 54 divided between the Sunderlage School (formerly District 51), Schaumburg Center School (formerly District 54) and the Elk Grove School. By this time, Robert Flum had been hired as the school principal and was fulfilling that position as well as teaching at the Sunderlage School. 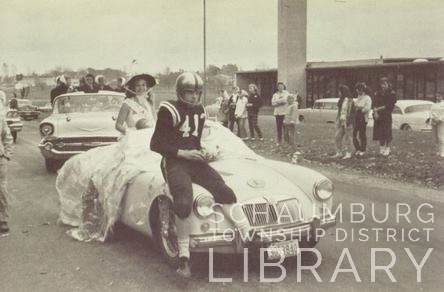 A couple of weeks later, on January 18, 1954, Schaumburg School opened. Around 80 students were now consolidated in a modern four classroom building with proper equipment and supplies–and indoor plumbing! Some of the teachers were Mr. Flum, Miss Anne Fox and Mrs. Paulus. Grades were doubled up in the school with the majority of the students enrolled in grades 1-4. 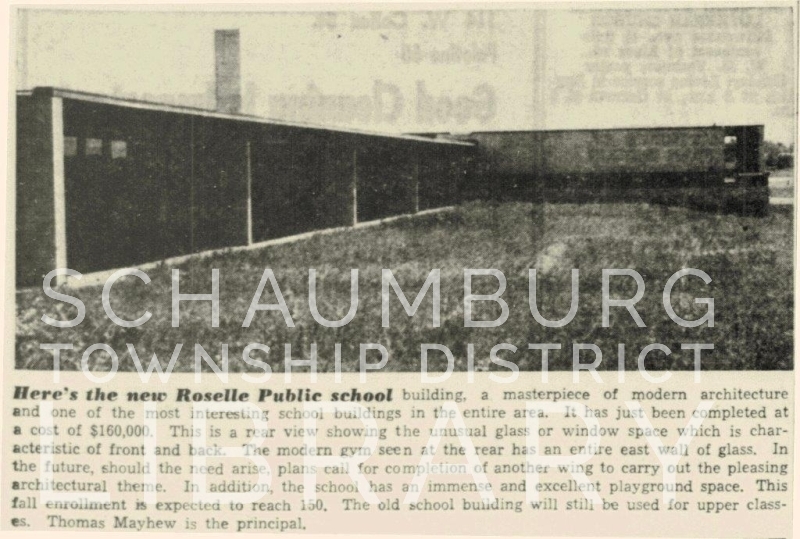 In viewing the building, it is obvious that Mr. Schweikher used Roselle School as a model for Schaumburg School. It is built in the same linear, one-story style with the four classrooms in a row and a slightly offset chimney in front that can be seen in the photo below. The differences were the windows, the style of the chimneys and east and west walls, and the fact that the play/assembly area in Roselle School was two stories. 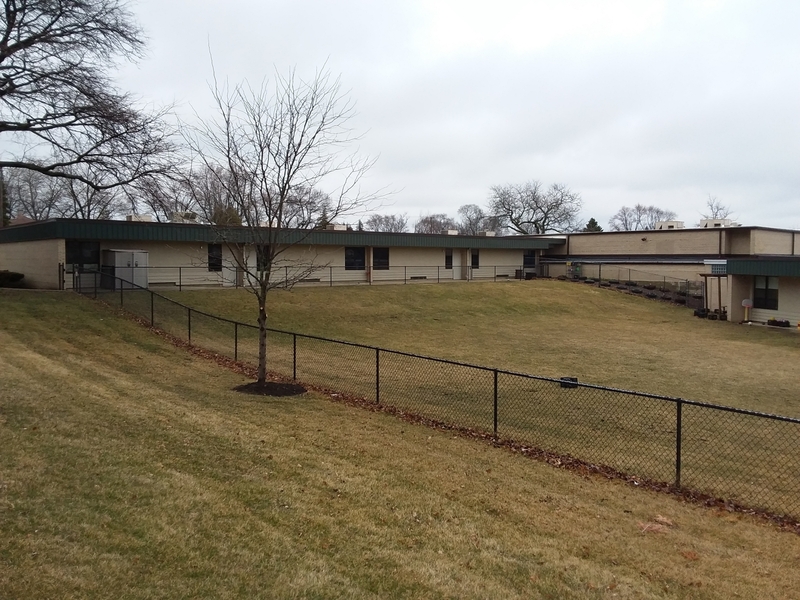 Where Roselle School (pictured above) had floor to ceiling windows with staggered framing, Schaumburg School had large windows that were framed without mullions. The chimneys were also decidedly different. Roselle School’s chimney was rectangular and brick. 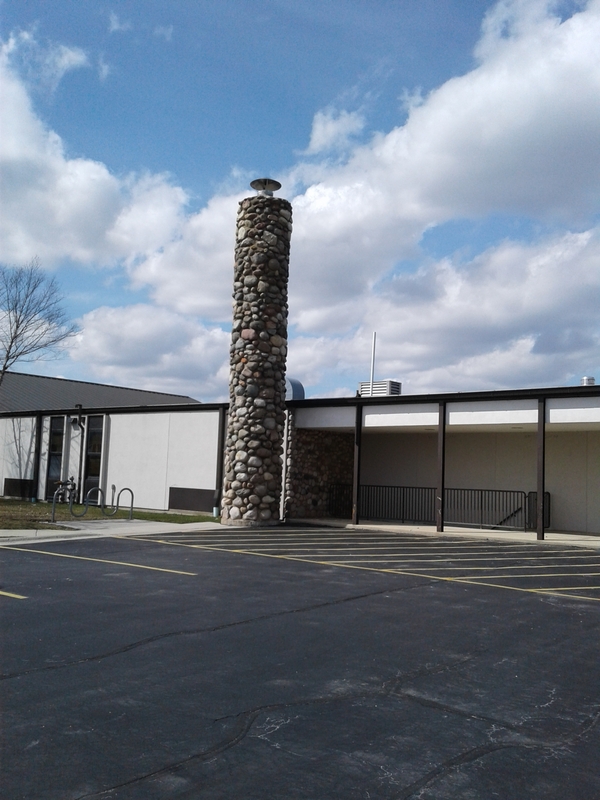 Schaumburg School’s chimney is comprised of field stones which, in my impression, were liberated from piles of stones that Mr. Schweikher must have seen in various farm fields of Schaumburg Township. He added these same stones on the east and west sides of the building. It was a nice, local tribute to the farms he was surrounded by. The chimney still exists today as do the walls that are now contained within the building. 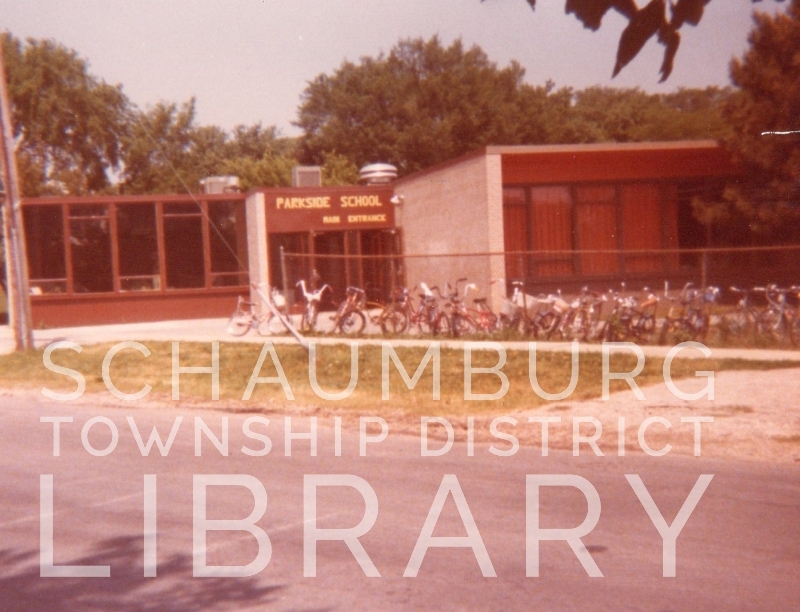 The play/assembly area in Schaumburg School was single storied and, judging by the Hedrich Blessing photos of the school, appeared to be adjacent to the front desk. The reception area consisted of one long desk and an open office area behind. The assembly area was opposite the desk. Open ceilings and open shelving could be found throughout the rooms of the building. This incredibly modernistic building in the middle of a field was the swan song of Paul Schweikher’s time in the area. It was quite a difference maker for a school district that was used to one room schools with rudimentary tools and equipment. And, even though the school was quickly added onto, we are fortunate that elements of his design still exist. The next time you’re driving past District 54’s headquarters on Schaumburg Road, take note of that stone chimney and stone wall. 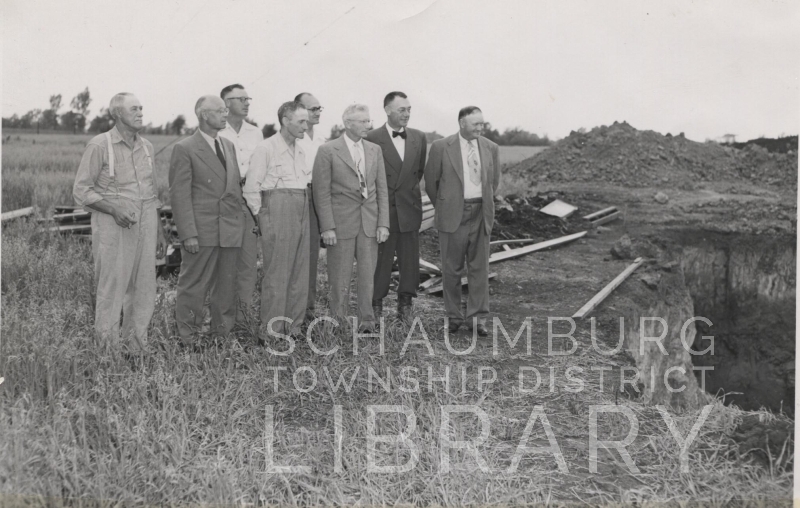 Not only are they part of Schaumburg Township’s rural history, they are also part of our modern history. This unique school, in fact, ushered in an educational era for a township that was only just beginning its phenomenal growth. The photo of the District 51 school is compliments of Marion Ravagnie. The photo of Roselle School is compliments of the Roselle History Museum. The last photo is compliments of the Paul Schweikher Collection at Arizona State University. 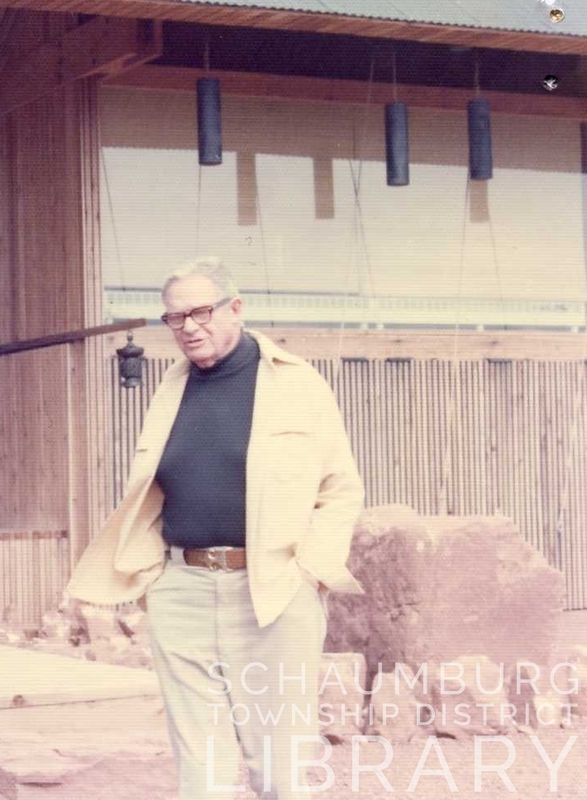 Before he left Schaumburg Township in 1953, architect Paul Schweikher did a couple of lasting favors for two local school districts. Roselle School District 12 and Schaumburg Township School District 54 were both in dire need of new schools for their districts. Roselle’s population had increased after World War II and Roselle Public School at Park and Pine was way over capacity with 176 students. 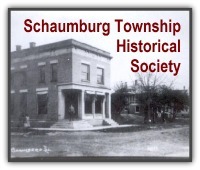 Schaumburg Township had recently consolidated their districts into one district for the entire township. 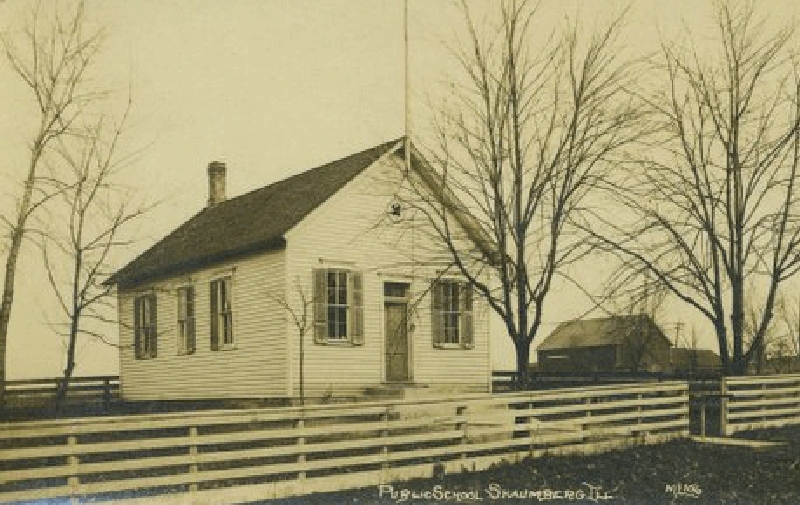 With only a couple of one-room schools in Schaumburg Township to accomodate the students who were part of the public school system, a new, modern school was desperately needed. Enter Paul Schweikher. Later, in a public notice in the April 11, 1952 paper, the Roselle school district put out a bid for proposals for construction of the school. Instructions for the proposals could be examined at the office of “the Architects, Schweikher and Elting, Meacham Road, Roselle, Illinois…” They would make copies available for a fee and checks would be paid to the order of the architectural firm. Eventually, in a June 20, 1952 article, it was announced that the E.W. Sproul Co. of Chicago had been “selected as the general contractor at a maximum price of $155,820.” Excavation work had, in fact, already begun and the building was expected to take six months though it did not open until February or March of 1953. Unfortunately, we do not have a professional photo of the finished product. The building was L-shaped with the classrooms and offices running parallel to Maple Street and the large play/assembly room running perpendicular. You can see this design best in the Roselle Register photo which shows the back of the school. The play/assembly room is bricked and to the right in the photo. Windows covered the entire south wall to the left, with each classroom having its own exterior door. You can also see these features in the following photo from the Roselle History Museum. Notice the skylight in the ceiling. Tom Troyke, Facilities Manager for Trinity Lutheran Church, the current owner of the building, said that the skylights had a louvre over them that probably allowed the teachers to direct sunlight into the room as they saw fit. The best photo of the front of the building is seen below and comes from Mr. Troyke. The cars in the foreground are on Maple Avenue and the front of the school and the circular drive is to the right. Notice the massive, rectangular chimney and the offset windows on the front. 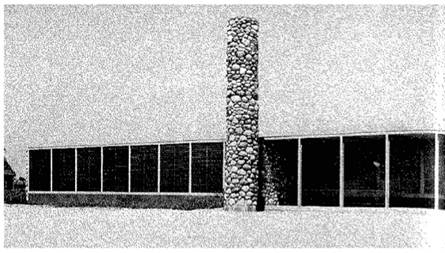 Chimneys are an important component of many of Schweikher’s designs–including his own house. And, we can’t see it, but the east wall of the gym was made entirely of glass! Five years later, in 1958, the school was added onto once again because the student population was continuing to expand in greater numbers. By this time it had been renamed Parkside School as seen in the photo at the top from Joan Beauprez, the historian of the Roselle History Museum. The addition was built adjacent to the play/assembly room which was probably bricked up at the time when the stage was most likely added. Eventually, over the years, the chimney was taken down, the skylights and original large boilers were taken out and the interior was redesigned. But, if you take a look at the Google aerial of the building–which is now the Trinity Child Care Center–you can see that the original L lines of the building are still intact. You can also see it here in the back of the building. 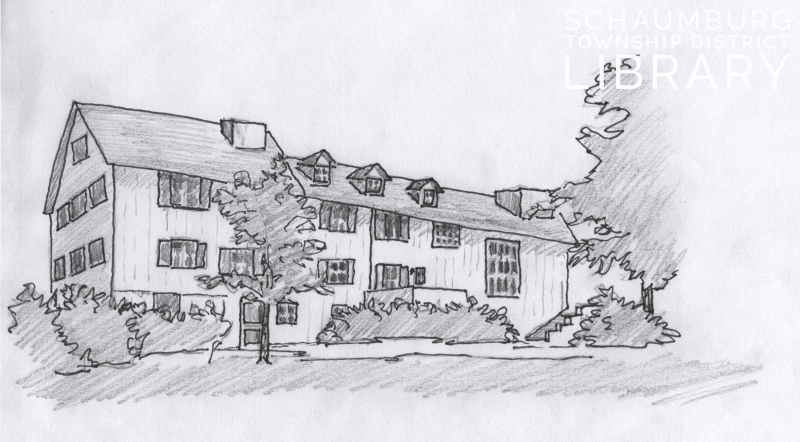 Schweikher was likely involved in the entire building process for the original design given that his office was so close and that potential contractors went there to get specifications for the proposal. His cutting edge design was certainly unique for this small town, even though this was the advent of the era of single level schools. Still, a school building that was largely windows on three sides? That is not something you see every day. 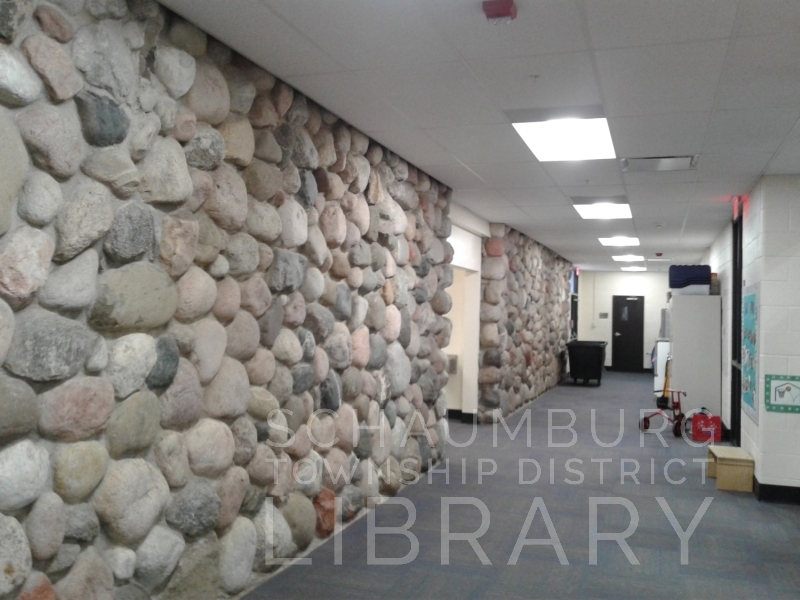 Interestingly though, the designs came in handy just a couple of years later when Schaumburg Township District 54 approached him about their new school. 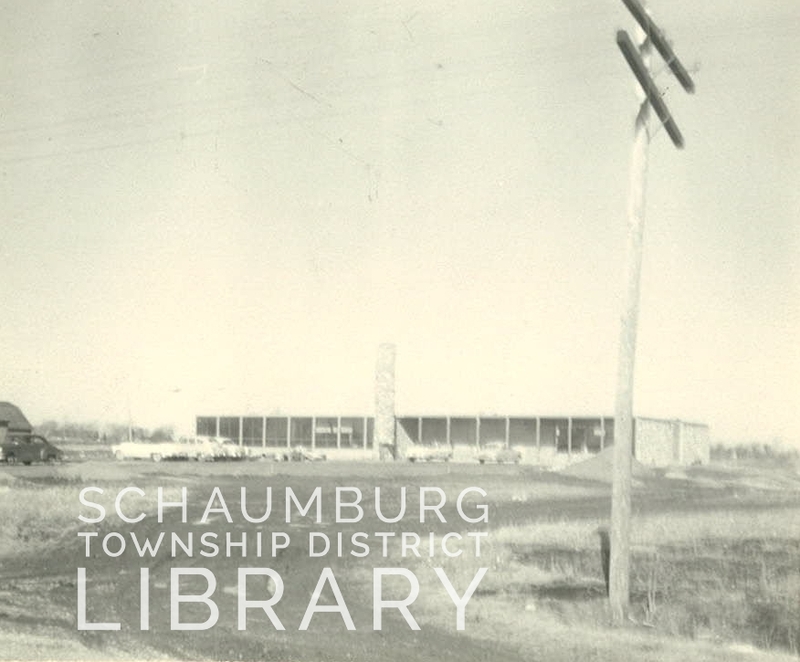 Read about that project and Schweikher’s last contribution to the Schaumburg area in next week’s blog. It’s an interesting comparison! 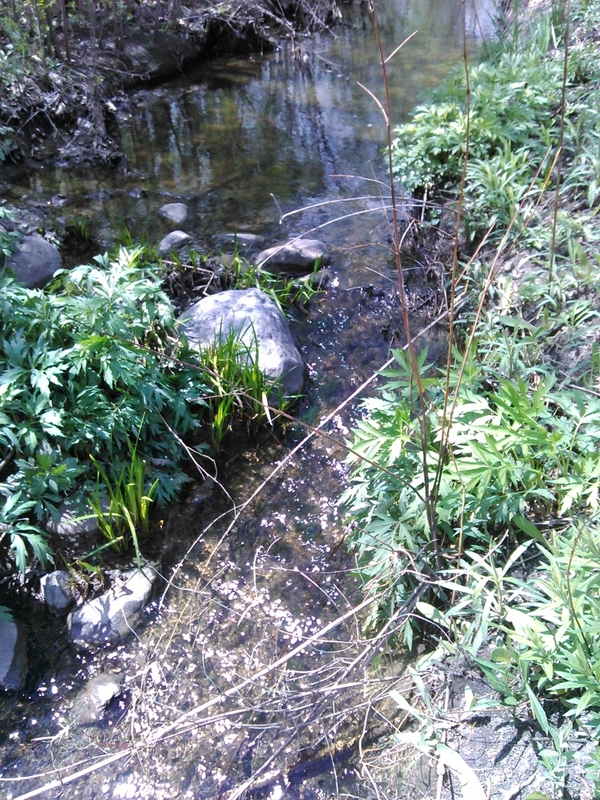 My thanks to Tom Troyke and Joan Beauprez for their sustained interest and support in researching this school. Without them I would not have had a tour of the building or photos that helped solve some of the mysteries. Their passion for their hometown was remarkable. 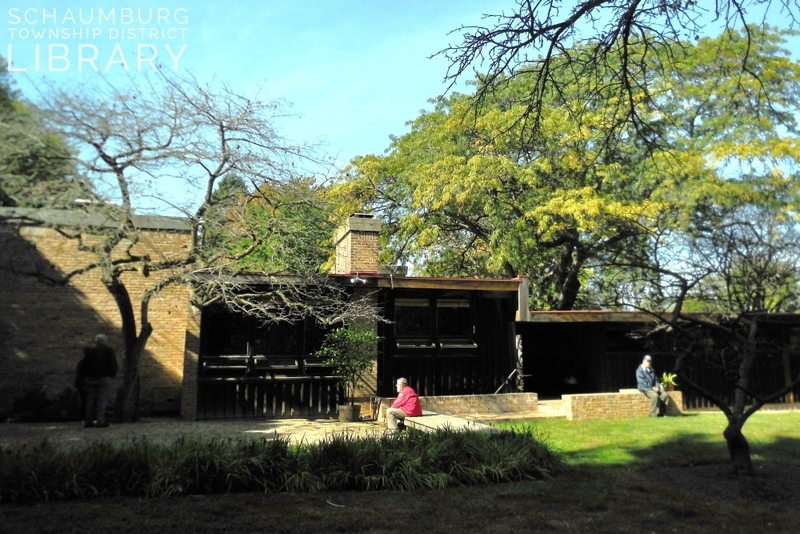 Who: Adam D. Gibbons; Northwestern University (BA History), Wake Forest University (MA History), Genealogist; will discuss historic architecture in the form of stone buildings in the Fox Valley area. When: Saturday, May 12, 1-2 pm.